If you’ve read books, articles, and blog posts and watched videos about making cheese, but you still haven’t done it, here’s an idea — buy a cheesemaking kit! Sometimes the prospect of buying the equipment and ingredients can seem just daunting enough to stop you in your tracks. That’s the cool thing about the cheesemaking kits from New England Cheesemaking. They provide almost everything you need. And the typical kitchen will have everything else. 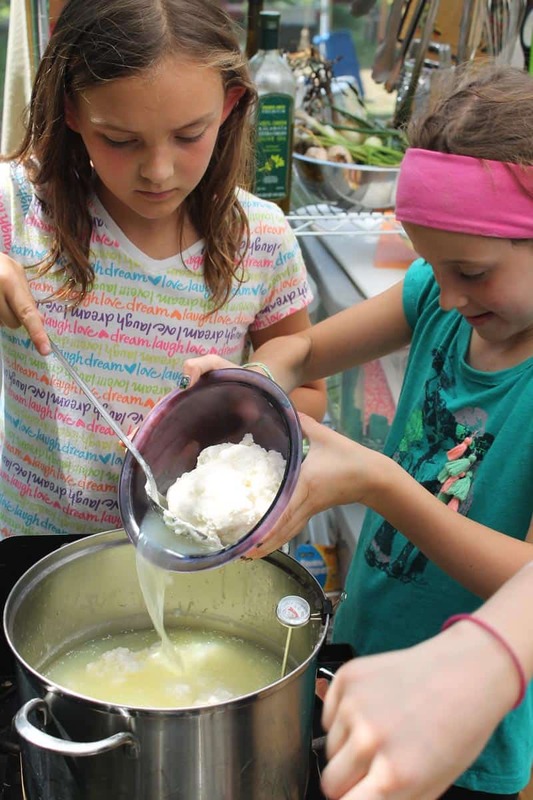 Their mozzarella and ricotta kit includes a dairy thermometer, muslin cheesecloth, vegetable rennet tablets, citric acid, cheese salt, and recipe book. As long as you have a 5-quart pot and a spoon, you are ready to party. Now if you’re still scared, do I have to tell you that last summer I taught 82 children, ages 8 to 15, how to make mozzarella? I’ve been teaching adults for years, but it’s super fun to teach kids, and I’m doing it again this year during our farm camp. The children have had zero failures. You can do it too! I have made just about every mistake in the book when it comes to making mozzarella, and most have been made while I was teaching a class. But I always wound up with cheese in the end. The only “unforgivable” mistake is using ultra-pasteurized milk. This is not a problem if you’re using your own fresh milk from your cows, goats, or sheep. But if you’re buying store-bought milk, be sure to check the label, and don’t get anything that says ultra-pasteurized, high-temp pasteurized, UP, or UHT. That milk has been heated to 280 degrees under pressure, which denatures the proteins, making it impossible to use for cheesemaking. The mistake I’ve seen the most with my quick mozzarella recipe is someone accidentally using 1/2 teaspoon rather than 1/2 tablespoon of citric acid, which I have done myself — twice! You will still get cheese, but only about half as much as if you’d used the correct amount of citric acid. I bought my very first cultures and rennet from New England Cheesemaking back in 2002, and I’ve been recommending them to beginning cheesemakers ever since. I would love this! I have a hard time using my hands due to RA, so I’m trying to get my sweet hubby to make cheese but he’s a bit intimidated. I think if he had a total kit it would eliminate some of his concerns! I know he’ll love it once he starts…. He’s an amazing cook and a chemist! Great idea! My husband is an engineer, and I knew once I got him to try cheesemaking, he’d be hooked, and I was right! I bet your husband would love making cheese. I have made cheese before but somehow never went back. Maybe I will win and get back to it! I’ve always wanted to try cheese-making, I just haven’t really taken the time to gather the information and supplies yet. You make it sound easy enough, I think I need to try it soon, though! We haven’t made cheese because we shipped our supplies internationally, thinking we were moving. Since we stayed we simply haven’t had enough milk to make cheese until lately. Excited to make cheese again! Would love to win this! I have been wanting to try making cheese for so long. I could live off of cheese! Lol! The only thing stopping me is I didn’t have access to rennet. I would love to win this, so my kids and I could learn tomar cheese, and I could further their homeschool education about where their food comes from. I’ve never made cheese but would like to try it. Thank you for the opportunity. I have been wanting to try my hand at making cheese from the goat’s milk but haven’t been able to gather the necessary information, ingredients and utensils to be able to do it. This would make it a lot easier to make my first goat’s milk cheese. My cheese making problem is sometimes it turns out “grainy”, instead of smooth and elastic. If you’re talking about mozzarella, it sounds like you just need to continue kneading it longer. Depending on how hot your microwave gets, you may need to heat it longer or more than three times, which is the typical instruction. I have made simple goat cheese but never ventured into “real” cheese making. I would love to win this kit to get me started! I have rennet and citric acid just waiting in my kitchen. But for some reason haven’t taken the plunge. I have tried to make mozzarella from my goats milk at least a dozen times and have failed every time not sure what I’m doing wrong.